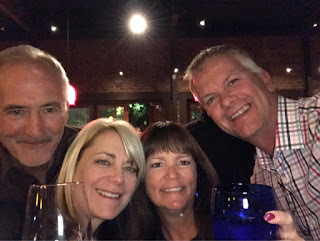 Sharon and I took an Uber downtown and met Donna and Kevin at Lucca's. The plan for the night was to explore a number of art galleries as part of the 2nd Saturday Art Walk and then finish with dinner at Lucca's. Walking east, our stops included: Viewpoint Gallery; Little Relics; Art Asylum; B Sakato Garo and Tim Collom Gallery. These were all in block bounded by I and J Streets and 20th and 21st Streets. After walking through a street fair on 20th between J and K Streets, we made one more stop at the Kennedy Art Center. We finished the night back at Lucca's for dinner. Sharon had salmon, while I had spicy penne pasta. After a nightcap at the bar with Kevin and Donna, we grabbed an Uber and headed home.